As explained in a recent post, Will Run For Miles is going to include, as a regular feature, a series of interviews with Hotel Representatives where they explain what their hotel properties offer and emphasize in terms of fitness, such as health facilities, gyms, pools and menu selections. Hyatt offers a dynamic selection of workout programs that cater to fitness-conscious business and leisure travelers staying with Hyatt Hotels & Resorts worldwide. Guests can maintain workout routines that they have become accustomed to at home or at the gym while staying at a Hyatt hotel or resort. The latest in cardio and strength equipment, modern mind and body exercise programs, and knowledgeable support staff are available to guests at each location. Virtual trainer in StayFit fitness centers, which allows guests to access their workout details/routine through a USB drive that can be plugged into the cardio equipment. 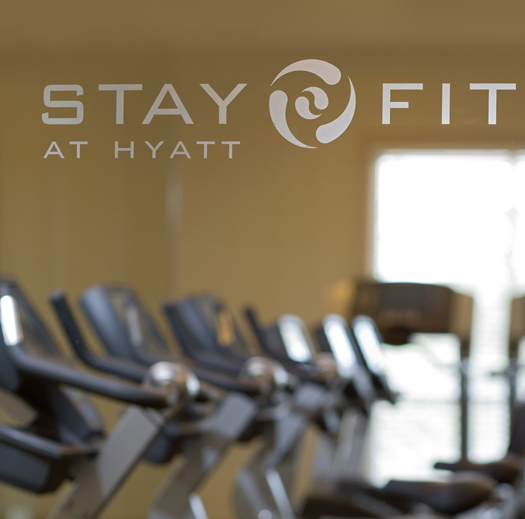 This way travelers can go from home to Hyatt, or Hyatt to Hyatt without missing a step in their workout routine. On demand workouts available on televisions in-rooms. Workout attire upon request in under an hour. Complimentary GPS forerunner armbands to help runners and walkers easily monitor their heart rate, course and distance as well as provide easy navigation back to the hotel. Athletic Minded Traveler palm-size route cards and digital maps for mobile devices to give runners and walkers of all levels detailed directions on one side of the map (beginning at each property’s front door) and a colorful map with mileage markers on the other (routes range from 2 to 8 miles) indicating interesting paths or trails around the hotel. Hyatt was the first major hospitality company to partner with Athletic-Minded Traveler, a leading healthy-travel and lifestyle media firm. At many Hyatt resorts, regularly scheduled yoga classes, private consultations and corporate group sessions – with certified YogaAway instructors – are offered at convenient times for guests. StayFit@Hyatt apparel, equipment and yoga mats and DVDs are available for purchase at many locations and arealso available on http://www.hyattathome.com/. In addition to exercise programming, we also have a StayFit Cuisine program in North America to meet the needs of our customers and meeting planners who look for healthful menu options when traveling. Having visited many Hyatt hotels, I can attest to the hotel’s devotion to the fitness demands of its guests. As Ms. Sheppard stated, virtually all Hyatt hotels have Jogging Maps, and Will Run For Miles has been collecting quite a few of them! We look forward to submissions by other hotels on this topic! The article has given over here is very interesting as the method discussed here about fitness center. These tips have full of advanced features and work in fitness.